Most of us have heard about the internment of Japanese Americans or the McCarthy era, but beyond hoping that such incidents do not repeat themeselves, we know few details about the disturbing history of American treatment of dissenters and "outsiders" in times of crisis. How did courts react to past infringements on civil liberties? 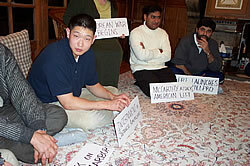 What coalitions arose to protest the attempts at ideological and ethnic exclusion? 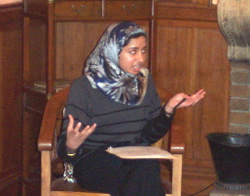 For our January 2002 meeting, guest speaker Shirin Sinnar, a Stanford law student with a specialization in civil rights, led a discussion on the treatment of immigrants, dissenters, and charitable organizations in past moments of crisis, and the implications American Muslims should take from this history.